We recently introduced a new section on the site where stumped homeowners like you (or me) can chime in and ask your hardest questions or what we like to call your “design agonies”. These Design Agonies are not full service design solutions or even e-design options/layouts, but more a quick design related question from you that you cannot seem to tackle on your own. 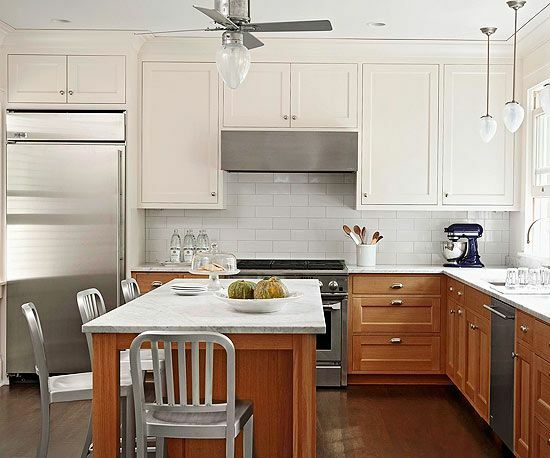 We recently had someone ask what she could possibly do to minimize the enormous expanse of orange maple cabinetry in her kitchen among other problems without renovating, so let’s check it out, to see the real severity of the issue. She was right, it was agony but we had a few suggestions for her to easily update her kitchen without having to remove what she already had. Here is what we came up with and sent back to her. PAINTING THE WALLS: One of the first things we notice about your kitchen is the nice natural light that floods in through the kitchen window and sliding door. Right now your kitchen feels dark and we can see how your cabinetry feels overwhelming. One of the first suggestions we have to make your kitchen feel fresh and bright is to paint the walls. The dark red color is making the cabinets feel more orangey than they actually are and painting the walls a lighter color such as a warm white or a light gray will help alleviate that problem. Also, once you paint the cabinets and the walls a lighter color the feeling of a gap between the ceiling and the cabinets won’t be as obvious. Because your countertops and the walls in your living area are warmer, we would stick with warmer shades of white and gray. See the inspiration board for color ideas. PAINTING THE CABINETS: We do like the idea of painting the cabinets, and it is a rather inexpensive fix to what you currently have. We think white is a good choice if you are looking for something bright and fresh. Or you could even try a warm light gray color (again picking something that would contrast nicely with your countertops). Taking into consideration the layout of your kitchen, we suggest painting all the uppers white and the lowers a darker color such as a dark gray or black (as you suggested) or another option might be to paint the uppers and lowers all white (which will really brighten the kitchen) and then paint only the lower cabinets on the island a darker color to make it stand out. A third option could be to paint the uppers white and the lowers a darker gray and then paint the island white and add some black hardware. OPEN SHELVING: Removing some of the upper cabinets and putting in open shelving would help your kitchen feel more open and less cluttered. We do think there are quite a few uppers and you could probably sacrifice a few if you can talk your husband into it 🙂 If you’re worried about removing too many cabinets, we recommend removing the uppers above the desk area like in the inspiration photo. This location for open shelving would make the most sense and wouldn’t affect the other functional areas in the kitchen. Another idea would be to replace some of your cabinet doors with glass cabinet doors to make it feel more open. However, we do think once you paint the cabinets lighter and remove some of the uppers you will feel a dramatic difference. If you do remove some of the cabinets, there might be some patch up work, but your painter should be able to tackle it and patch up those areas. We love these small arched shelf brackets, as well as the small strap shelf brackets to hold up your shelves as you can see in the inspiration board. HARDWARE: Another thing we noticed is you don’t have any hardware on your cabinets. To give your kitchen some personality, we suggest adding hardware to your cabinets. It will help finish off the space and add a nice touch. You could do a polished nickel, a matte brass, or we like the look of an oil rubbed bronze with a gray and white color scheme. Both Schoolhouse Electric and Rejuvenation have some great hardware options. We like these knobs and these pulls if you wanted to go for the oil rubbed bronze. ROMAN SHADE: To further complete the kitchen, we suggest a roman shade. It’s also a way to add color or pattern to the kitchen! We recommend taking down the art above the kitchen sink and having a roman shade custom made to fit your window. BACKSPLASH: Another way to finish off the kitchen is a backsplash. We’re are not sure if changing the countertops is in your budget, but if so, we would suggest a light colored caesarstone, maybe not bright white, but something with some slight veining. If switching out the countertops is not in the budget, we would suggest a super simple backsplash (to keep things from feeling too busy) such as a marble/cararra/caesarstone with a slight veining to complement the tiled countertops. All in all, this kitchen has some major potential with a few updates, so we are excited to see what she ends up doing. If you have a similar design issue or something that you just cannot seem to tackle on your own then we are here to help. Head on over to this page and fill out our questionnaire to get the process started. Just bought a little cottage and this post is a big help. If all the cabinets are white would you use white or stainless appliances? Its a very small kitchen. Love your ideas. Thanks! While I like the suggestions and the inspiration photos, I have to push back a little bit on the idea of “Unattractive 90’s style maple cabinets.” Maple is actually a warm, lovely wood, and you see it a lot in bright, cheery Scandinavian design. These cabinets may be out of style right now, but inherently, I don’t really think they’re unattractive. It just seems unrealistic and fairly wasteful to have to change something as expensive as cabinets every time trends change. I do appreciate that the suggestions involved paint and not a complete replacement, but I think the more interesting challenge would be to see how you could work with those cabinets as they are and change things around them to create a fresh look without ruining the nice wood finish. I would have trouble painting those cabinets, given their newness and condition, but I would replace the paint, flooring and countertops for sure, and add hardware and some open shelving, then reassess. Then start small, like with just the island. Yes, I agree on making paint, backsplash and countertop changes before painting the wood cabinets. The ceiling fan could also be updated to a more modern looking white fan relatively cheaply/easily (although modern fans with good lights are hard to find, in my experience). I like the tuxedo/open shelving/whitewhitewhite thing that’s currently in style, but it’s already been “in” for a couple of years, and nothing lasts forever. If you can spare the storage space removing a few of the upper cabinets might open things up regardless of the cabinet finish. I personally like the painted suggestions but I also agree with you about the wood being warm. An alternative to painting all the cabinets would be to do a white/wood two toned kitchen. Painting the uppers white and leaving the lowers wood but adding new hardware/countertop/backsplash. It freshens up the kitchen without completely covering the warm wood. If going the white and wood route I think I would still paint the island though even if I left the rest of the lower cabinets wood. Maybe a favourite colour that goes with the wood or go with a dark grey. As ever, thrilled to see Emily’s paint choices and badass hardware. As usual, I love this post, but I am loving the smart commenters just as much. The inspiration photo here is a dream, but your cabinets seem lovely, just not in vogue. Instead of chasing trends, could you be the trendsetter? In the world of instagram and pinterest, trends are moving faster than ever. I don’t think you can ever go wrong with white cabinets…IF you like white cabinets, but if you would like your own cabinets if only they were in style, forge ahead setting a new trend! I hope you will follow up with what you decide. I’m going to have push back on this and say… that color maple is terrible. If it were a nice shaker or flat front style clear coated light maple style cabinet that’s one thing. This is orange stained maple in a late 90’s track house. Do. not. get. me. wrong. This is exactly what I have in my apartment and it took me a YEAR to get my landlord to agree to painting them. Night and day transformation! I highly suggest it. But lets be honest. Not all maple cabinets are created equal. Painting the cabinets white would open this room up so much. I’ll never understand those who are so opposed to painting wood. The maple looks dreary. White cabinets are classic, too. I have always had white cabinets and always will. I don’t think Emily is being trendy, in this case, but is addressing the personal taste of the client, as she should. Painting the cabinets seems like a great solution, but Im curious about the quality over time. What steps do you need to take to get a lasting finish when painting over varnished wood? Young House Love has a GREAT tutorial on painting cabinets if you go the DIY route. It took forever and there are lots of steps but I truly think the quality is great and will last a long long time. I’m not sure how much it costs to get them professionally refinished or sprayed, but I doubt it would be that expensive. My question is more aimed at what to do about cabinet doors with the awful, 90s routed pattern. We’re moving into a house where the previous owners painted cabinets very similar to these a warm white, but I’m having a hard time getting past the arched pattern routed into them. Is there a way to cover or fill (wood filler/sparkle, bondo..) that channel and repaint to create a smooth, flat surfaced cabinet or am I better off replacing the doors? The woman is a DIY genius so results may vary. Yes! Thank you!!!! This is exactly the post that I was looking for and I thought I was going crazy not being able to find it! Her kitchen mini-reno post didn’t go into detail on how she turned her identical-to-mine cabinets into shaker-style other than using the corner moulding. I’ll have to evaluate whether or not I think it’s worth it to try to replicate.. Like you, the older I get, the less adventurous I am in DIY-territory and Jenny, being the DIY goddess that’s she is, sets the bar extremely high. If you like the shaker style look you could also get some trim wood and fill in just the arched portion to square everything off. You can find a router bit close to the one used on the cabinets, cut the shape out and use the reverse of the bit profile. Glue it onto the door, fill in with wood filler as needed, sand, and repaint the door. If your DIY game is lacking I don’t think refacing cabinets is too terribly expensive depending on how many you have of course. The older I get the less I want to DIY so I always price it out with a pro first. I just totally updated an old dark wood bureau that had lots of floral patterning carved into the front of the drawers. I used simple Elmer’s Wood Grain filler (much easier to work with than Bondo) and sanded and then painted and you’d never know there was a pattern, previously. You’d probably have to do several thinner layers since your carved out areas are likely deeper than what was on my bureau. Great point. I agree that the routing is the real culprit here. Like the commenter above, I also immediately thought of Jenny Komenda but a different post: http://littlegreennotebook.blogspot.com/2012/11/diy-shaker-style-cabinets-part-2.html?m=1. Obviously only going to work if you’re ok with painting your cabs. Yep that’s probably a better one for a kitchen where the cabinets will get a lot of abuse. Just a thought – i have also seen a kitchen where the inside of the cabinet doors had a shaker style and the homeowner turned the doors around. obviously you will still need to fix up the hinges and fill those hole – but worth a look??!! My sister did that! Started out oak with that 90’s routed wood and she flipped them and painted them gray–great, cheap update. Sometimes, if you flip over cabinet doors, the inside has a shaker style to it. Mine did, but the darn holes for the hinges were too big to fill in a structurally safe way… so I had to deal with the awful inset style. But painting them crisp white really made a huge difference. If doing a backsplash in stone is cost prohibitive, a simple white subway tile backsplash might work with the existing tile counters (hard to really tell what they look like) and then a stone countertop for the island would add slight pattern from the veining and give the elevated look of high end stone, but with less square footage and an easier install than doing the backsplashes. You might even be able to find a remnant, depending on the size of the island. Just thinking out loud! If you want to DIY paint the cabinets, I painted mine two years ago with Annie Sloan chalk paint. Test the paint on some spare 2×4 first, so you make sure you like the look–it’s a paint with more character than a factory finish–but if you do, the real win is that you don’t need to sand your cabinets before painting and in between coats so it’s much easier and less messy than using oil or cabinet alkyd paint. I used a base of Old White (a rich cream, but more viscous and than the Pure White, which can’t be used on it’s own) and two coats of Pure White for my uppers and two coats of Graphite (a moody charcoal/navy color similar to the inspiration pictures) for my lower cabinets and sealed everything in her clear wax. I get compliments on the lower cabinet color all the time and it changes throughout the day, which I really like. I used a micro cabinet roller for most of the cabinet surface (smoother finish than a brush) and a brush for the detail work, which I tackled first. The only time I had to touch up was when my husband spilled a fresh pot of coffee down the cabinet and some got caught in a groove while I cleaned up the floor and the paint came up. Touch up was simple though, and that was the only incident. No chips from regular wear and tear. I highly recommend it if you’re interested in doing the work yourself. I would do it again in a heartbeat. Good luck! What kind of cabinets are yours? I am interested in painting ours but the box part is laminate (doors are hardwood) and I am worried about how the paint will hold up over time. Mine are maple, the doors and exterior boxes are also wood. The interior is laminate, but I didn’t paint that area. You could try painting a small section on the inside to see if the paint takes to laminate, perhaps? Sorry this wasn’t that helpful! About to take your advice and do the same in my apartment kitchen – painting the cabinets white would definitely breathe a breath of fresh air into another dated (and boring) space. I was so excited,I sent my husband the post to read. This is exactly the same situation we are facing with our kitchen and the layout is very similar. We have been discussing painting the cabinets white or light grey to brighten things up. We certainly feel a lot more comfortable with starting this project after reading your recommendations. Thank you so much for sharing this with us. I am looking forward to seeing the after pictures. Another option could be sanding, stripping, and staining the cabinets. Painting is so much work. Staining really isn’t more work and the results look much more expensive. White Wash pickling stain will lighten the cabinets while maintaining wood grain. If you have real wood cabinets (not particle board – like ikea) show it off. Those cabinets cost a pretty penny and light, white or gray, stains really are transformative. White paint can do wonders for terrible cabinets! While I’m not going to get into the paint vs no-paint argument (I would paint, haha), I have to say that judging by the state of their current countertops, these people are not candidates for open shelving. Open shelving makes rooms look MORE cluttered (even neatly organized ones! ), not less, and it takes a very particular personality type to keep them looking decent on a daily basis. I agree. I think this is especially an issue for kitchen’s without a unifying backspash that ties the base cabs, shelves, and uppers together. Light paint will do wonders for this kitchen, but a backsplash that extends up and behind the shelves will do much much more. That connective thread really cuts the visual clutter!! And lets face it – most people have a lot on their countertops and shelves. I certainly do ! Can you please elaborate when you say “taking into consideration the layout of your kitchen, we suggest painting all the uppers white and the lowers a darker color such as a dark gray or black”. I LOVE this idea, and I am considering painting my galley kitchen in this way but I am now curious if you’d suggest all white given the galley layout. I was in the scandanavia this year and I think it’s really funny what Americans are calling “scandy”. People, there is no one “scandanavian” style. But I will say that natural wood is alive and well there. I have maple (or maybe they’re birch?) custom built cabinets in my kitchen. They are a square panel. The island is painted navy blue (which was SO OUT THERE when done 10 years ago!) The whole feel is very nice. One thing that Sarah Richardson always said on her shows that I have taken to heart is to keep embellishments on cabinets to an extreme minimum because they go out of style so quickly. If you keep to a simple form, you can change the other elements around without major expense. Good advice. I think with these cabinets, it’s the shape, not so much the color. This Design Agony post was great and a million times better than the last one. The suggestions for how to fix the room were much more thorough and also much more attractive (and more “Emily”) than the ones for the previously posted breakfast nook. I loved the inspiration photos and would like to see credit links. I thought many of the readers had great suggestions too! i’m a lover, not a hater, but i really hate that the lead photo for these posts has nothing to do with the final reveal of these projects. I’m a total lover too. Hoping we get to see an “After”! Our home had the same cathedral-style uppers and more traditional lowers in this SUPER glamorous golden oak similar to the original poster’s maple. I hated the cathedral cabinetry’s arches and the color but because the cabinets were custom and made out of super thick wood, I also hated the idea (and cost associated) with ripping out perfectly good, high-quality cabinetry and replacing it with expensive, poorer-quality cabinetry. We ended up hiring someone to paint them white and we couldn’t be happier. For $1,200, the cabinets look brand new and I don’t even mind the cathedral uppers anymore because it adds a bit of character to an otherwise super modern kitchen. We completed our facelift with a new backsplash (marble subway tile in a herringbone pattern) and changed out the hardware to something very similar to Emily’s inspiration kitchen with the green/grey lowers. You’d be surprised at what a coat of paint and some new hardware can do! No one can believe they are the original cabinets – and that it cost us less than $2k for our entire kitchen reno. Outdated cabinets are definitely a problem. We renovated our kitchen in late 90s I think and put cherry in. The problem is, most people don’t have the money to buy new cabinets every decade or so. The kitchen was the costliest home project I’ve ever done. Although I still think the cabinets are lovely, it’s true that they look a wee bit dated with the beige tile behind them. I vote for painting all of the cabinets since part of the issue with the kitchen is all those maple cabinets against the wood floor. In addition, I suggest removing that hanging pot rack thing over the island and replacing the 80s fan with something sleek and elegant. Amazing suggestions Emily! Still the best blog ever. This is exactly my kitchen dilemma! And I’ve been pinning tuxedo kitchens so it’s nice to get validation along with suggestions on specific paint colors. Love this post! And I would LOVE to see any after pictures of your design dilemma or e-design clients! I love to cook and it is a distinct hobby of mine, and one that I like to indulge in every single dayoftheyear. This open shelving concept in the kitchen really doesn’t resonate with me at all in that if you cook, (ALOT), grease and steam and heat are inevitable, and anything that’s out on the counters or by the stove or thereabouts on open shelves or close proximity to the appliances, gets dirty (think microwave vents for starters). While it may look pretty in a picture, I really find it rather unfunctional in a kitchen. There’s something to be said for kitchen cabinets, with doors, and there’s a reason for that; keeps appliances and dishes clean, for starters. I’ve always lived in very small spaces so sacrificing cupboard space for an open shelf or two is out of the question. I’d love to see this kitchen go white and bright, and I think the transformation would be nothing short of miraculous! Or keep the black appliances, but definitely paint the walls and cabinets white; this is a wonderful space and I hope you’ll post an update……. I read through the comments & I don’t think anyone mentioned the idea of raising the cabinets. Taking them up to close off that open area above would make your kitchen feel more open & lighter. I’d run a small shelf below, leaving it open for your everyday dishes & glasses. A really inexpensive way to incorporate the open shelves look without too much mess. My favorite example is also a tuxedo kitchen, which I think would work beautifully in your house. I was suffering from the same problem! And did almost everything you taped about in this post, plus flooring and minus open shelving. I now LOVE my kitchen! It’s so bright, clean and modern! I had a triple whammy of a kitchen last year: Oak cabinets, ORANGE walls, oak floors, and black quartz counter tops. I had a Halloween kitchen! So, I updated by painting the cabinets, installing a new backsplash, new paint for the room and a few other changes. BIG difference! Don’t get me wrong, it was hard work and it wasn’t a quick fix, but it made a huge difference and saved us thousands of dollars. where can I get those black stools in the first image? I simply discovered your blog and enjoy reading it. Keep on. very interesting ! Keep these posts coming Emily. I love it! While I agree that maple cabinets are more classic/traditional than a nineties trend, the client specifically mentions being “willing to paint the walls/cabinetry” to “brighten the place up” so Emily is addressing her clients willingness of what she’ll do to change the look. She’s just doing it with humor and her usual quirkiness that we know and love her for. I too am moving into a house (rental) with an awesome kitchen but with maple cabinets I’m not crazy about … But I do love a modern kitchen and think her renovation ideas are on point! I especially love the light dark paint contrast as well as the combo of grey with bronze hardware! More unexpected than grey and nickel/chrome. Another awesome post Emily!